There is a Album meme going around. I had to cheat a bit because I needed to find a Flickr image that wasn’t space-balled. Head over to “Wikipedia.” hit Random and the first article you get is the name of your band. Then go to Random Quotations and the very last quote of the page is the title of your first album. Then, go to Flickr and click on Explore the Last Seven Days and the third picture, across will be your album cover. Put it together. Be free to cheat. It’s more fun. 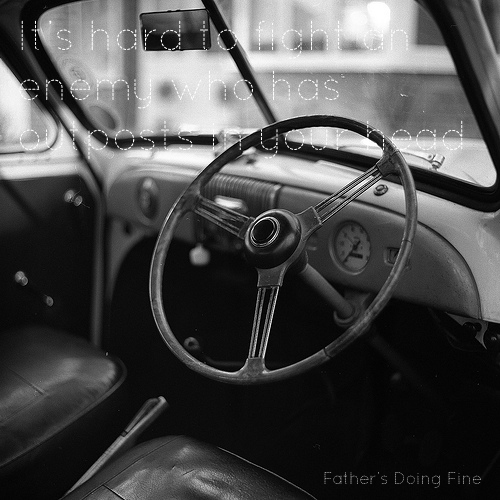 So… this is “It’s hard to fight an enemy who has outposts in your head” by Father’s Doing Fine. ignore me if you like. 1. Write down five things that you’re thankful for. 2. Tag five friends who you’d like to see participate in this meme. 3. (Optional) Include a link to this post and encourage others to place a link to their completed meme in the comments section of this post so we can keep track of the thankfulness running around the blogosphere. 5. All the ways that God has orchestrated this wedding planning crap and all amazing offers from those we know and great prices and ways that it’s worked out. apologies in advance to the meme haters. and this reminds me, pumpkin pie must be on the agenda in the next few days. To throw a spanner in the works of a slow chugging machine, I am participating in yet another, (This is possibly number 3?) meme. Christina has tagged me about ‘obsessions’. As I’ve grumbled about before, memes seem to very much be a social network cliche, so what better a place to start! 1) I dislike cliches – quite a lot. I use them usually only if I am extremely tired, purposefully being annoying to others or if it’s too embarrassing/inappropriate a situation to make up my own. 2) No longer an issue, but I used to ‘have to’ turn off the hot-tap on the shower last. In that, the hot might go off first, but the final turn would have to be that certain tap. 3) A mirror of one of Christina’s obsessions, it drives me a little crazy when people don’t take their teabag out before they put milk in, my theory is the same as hers besides, it makes the teabag look disgusting. 4) Spelling, Grammar, Punctuation. I write some fairly flawed posts/other however if it is a professionally used document/menu etc, spelling MUST on all accounts be correct, along with grammar and PUNCTUATION. A particular loathing is the boganised ‘You’ – Youse/Youze. It drives me mental. 5) I just about cry if I see people using Comic Sans/Curlz MT Fonts on anything. Rather than tagging anyone specific, what are your obsessions?